The five-year stock chart of Walmart Inc (NYSE:WMT) shows the different narratives surrounding WMT stock over that time. For most of 2013 and 2014, the Walmart stock price basically was flat. The broad market itself wasn’t particularly strong. Walmart’s numbers were OK, but not great. WMT seemed relatively safe, but not particularly compelling. After a brief late-2014 gain, WMT stock dove for most of 2015. It would lose one-third of its value in less than a year. Fiscal 2016 (ending Jan. 31 of that year) results were awful. Walmart’s revenue declined year-over-year for the first time ever. The company seemed to be losing to Target Corporation (NYSE:TGT) on the brick-and-mortar side. Meanwhile, the rise of Amazon.com, Inc. (NASDAQ:AMZN) threatened further competition from e-commerce. But the Walmart stock price would bottom in late 2015. For the next 16 months or so, WMT eked out modest gains as a value play. Bulls saw a sub-20x multiple assigned to the world’s largest retailer. Bears saw a company still not quite prepared to manage the brave new world of retailing. And then, a little over a year ago, WMT began a massive rally as the narrative changed again. Backed by multiple buys in the e-commerce space, including the $3 billion acquisition of Jet.com, suddenly it looked like Walmart was a legitimate competitor to Amazon. Walmart gained 43% in 2017, and at its all-time high in January 2018 had gained over 60% from the beginning of that year. But a disappointing Q4 report has changed the narrative again. WMT stock now has dropped 19% from those January highs. And it could get worse unless Walmart can prove the current narrative wrong. The narrative heading into the Q4 report was that Walmart had created a huge opportunity in e-commerce. Management was targeting 40%+ growth from e-commerce, which on top of steadily improving comparable in-store sales laid the groundwork for consistent growth going forward. So there are two reasons WMT stock has fallen so sharply in the wake of the Q4 report. The first is that the Q4 miss, particularly relative to e-commerce revenue, undercut that thesis. The second is that the rising Walmart stock price didn’t reflect, necessarily, better near-term growth, but rather a long-term outlook. But 2.1% isn’t exactly a compelling figure. Meanwhile, margins are under pressure: Walmart posted adjusted earnings-per-share growth of barely 2% in FY17, and just raised its dividend by the same 2% amount. There’s not a lot of growth here — certainly not enough to support the 22x+ EPS multiple at which WMT traded less than two months ago. Without e-commerce, it’s tough to see that growth accelerating, or that multiple expanding. Can E-Commerce Rescue WMT Stock? To be sure, one quarter doesn’t doom the story. I actually recommended WMT ahead of earnings, at about $105, so I’m not ready to throw in the towel yet, myself. But the 23% growth in e-commerce in Q4 has to accelerate next year. An 18x+ multiple to the midpoint of FY18 guidance still incorporates relatively steady profit growth going forward. 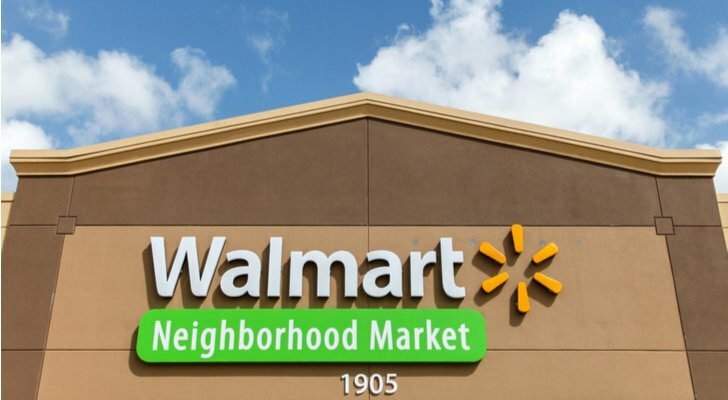 To protect that growth, Walmart needs to succeed in e-commerce. To accelerate that growth, it needs to be a major winner. And at the risk of reversing field so quickly after a single quarter, I’m not nearly as convinced as I was that Walmart can do so. I’ve made the point with retailers ranging from Abercrombie & Fitch Co. (NYSE:ANF) to Target to Best Buy Co Inc (NYSE:BBY) that e-commerce hurts margins. Walmart has no choice but to build out its e-commerce business in this day and age. But that’s exactly the problem for the retail sector as a whole — its participants have no choice but to play along with margin-impacting investments and discounted pricing. If they won’t, someone else — notably Amazon — will. With Walmart stock at $89, there is a case to be made for buying on the dip, as Tyler Craig argued. An 18x multiple suggests downside shouldn’t be that bad if Walmart disappoints again in 2018, and if the e-commerce side rebounds quickly, upside could be large. At this point, I’d rather wait this out, however. It’s too tough to trust any retailer in this environment — even the world’s largest. That’s why sentiment toward WMT stock keeps changing so much, and why the Walmart stock price keeps making such big moves. But at the end of all of that movement, Walmart stock hasn’t been a great buy: it’s gained about 20% in five years. For WMT stock to do better, the e-commerce business needs to rebound. The confidence lost in Q4 will take at least a couple of quarters to regain. Article printed from InvestorPlace Media, https://investorplace.com/2018/03/walmart-inc-still-has-to-prove/.